As I sit down to write this, it's 1:45 P.M. on April 26, 2011. Exactly two weeks ago, I was talking with my husband's heart surgeon about how things had gone in the Operating Room. I thank you all for praying for Jack and for our family during a really difficult time. For weeks now, my heart has been full of matters of life and death, hope and despair, assurance and doubt. All important matters, to be sure; all matters with which to be wrestled. I'm grateful for the chance to consider such weighty issues; I'm grateful for friends who will help me; I'm grateful for a God who's willing to meet me right in the middle of my struggles. You know what I'm thinking about right now, though? I'm thinking that it's good to take a break from weighty issues. I'm thinking that it's good to ponder non-weighty issues as well as weighty ones. So I'll show you a little project I've had going on the past couple of weeks. 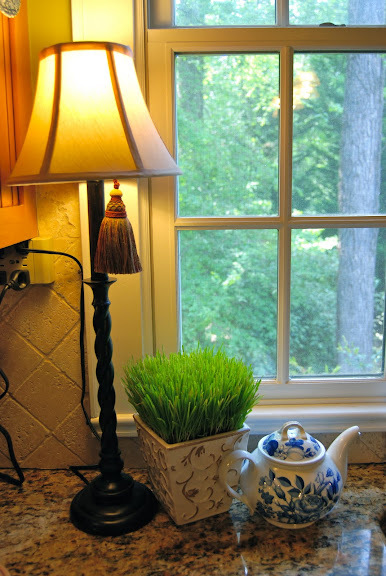 Thanks to my darling friend Melissa of 320 Sycamore, I grew some wheat grass! Yep. It may sound silly, but one little touchstone of sanity for me in the past few weeks has been growing some decorative grass. I nurtured it to green fullness in an ugly old 9x13 pan. It probably looked crazy for me to have that on my kitchen island while my husband was in the hospital, but every time I came home, it was fun to see that my grass had grown. And I put some of it in a basket with my mother's collection of Easter eggs. I'm not going to win any awards for creativity or artistry, I know. But it sure has been good, in the midst of highly significant events, to concentrate on something as insignificant as growing grass. A bit of balance, you might say! How about you? Is there something small that helps you find balance? sometimes we just need the simple things to make us smile!!! When our (then) 3 year old daughter was going thru cancer treatments and we had many MANY extended stays in the hospital, I began to really miss cooking. We experienced a tragedy in our extended family over the last week and I've found balance and sanity in two things. Going to the gym has been my getaway, the place where I go to work it all out of my system. Mundane chores have been a lifesaver too. But I really like your idea of growing grass, something that is natural and green and shows progress day by day when you feel like you're progressing at a snail's pace in everything else. I have been wanting to try to grow some too. I kill all plants though, so I am a little afraid. I'm so glad you found a little happiness with all the weighty worries you had going on. Glad Jack is doing well! We love growing wheat grass! It's so quick you can practically see it growing. Yours looks great in the Easter basket and planter! I think your wheat grass is lovely in that planter and the cute basket! I completely agree with you that little things like that can be so wonderful for calming nerves! I always like to just sit and pet one of the dogs...makes me feel so much better. :) So glad your hubs is on the mend!!! Glad things are going better. Wheat grass is so pretty. I like what you did with yours. I think you definitely need the simple in your life. (((Hugs))) I hope Jack is feeling well. You know, I don't think it's very insignificant. It reminds me of this book by Sarah Dessen that I read in high school. Gah, she's had so many books published now, I can't remember which one it was. Basically, though, the main character Annabel's (a high school girl) older sister (I think her name was Whitney) had gone to New York City (I think) to model, but she started having issues with eating disorders, so she came back home. One of her therapist's assignments for her was to grow a flower and keep it alive. It was a way for her to concentrate on something other than her illness. Your grass reminds me a lot of that part of Sarah Dessen's story. It may seem trivial, but it holds a lot of symbolism. Maybe that's just me being an English major. I could just be looking into it more than I should. But it just reminded me of that scene from the book. It's a really good book, by the way. You should totally read it. :) Especially if you read and liked Speak by Laurie Halse Anderson. Growing things is good for the soul. I never get tired of the thrill of planting a seed and witnessing it come up and mature into a healthy plant. I've always wanted to grow grass to use for Easter decorations but I always think of it too late. I love how you used it with your mom's eggs and also in the other container. I hope things will be "normal" in your house soon. I LOVE YOUR WHEAT GRASS! I think it looks really cool on your kitchen counter by the window. And the container is pretty! What a fun way to bring spring inside the house! Love your grass!!! I grew some last year and had to cut it almost everyday. It was so much fun to watch it grow. Loving yours! Life is really about the simple things, isn't it? I can certainly understand where this project gave you such joy.